UPDATE: http://studiostyles.info/ for a great growing community of Visual Studio Styles and Themes. You can create, import and export themes in your browser! I run my Visual Studio.NET with Consolas 15pt and have since I discovered Consolas. I like to run at a big(ger) font for a few reasons. First, it looks best at 15pt. 16pt? Crap. 13pt? Please. I also run it with a white (paper-like) background and the default colors. I also tend to run FullScreen with SHIFT-ALT-ENTER. More and more though I hear that folks are vibing on the black background again. Personally, I've always found the black blackground folks to be a little creepy - just a little too black t-shirt, if you know what I mean. Lately, though, it seems, that folks I respect have been trying the black background thing. A while back Atwood blogged about this. There's a lovely theme for Mac folks running TextMate using the Monaco Font by this fellow at Vibrant Ink. Folks with "TextMate Envy" can get a free Monaco Font for Windows here. Since that was so easy to find, I figured I'd try black background world also. But not just "switch to black background," no, no, that'd be too simplistic. I need to pump up the color on the foreground as well. Changed the font to Monaco in Environment|Fonts and Colors under "Text Editor"
I think I'll leave it like this for a while and see what happens. Feel free to post links to a screenshot of your colors and fonts in your editor in the comments. Put the link to your screenshot in the Home Page field in the comment and your name in the comments will automatically turn into a hyperlink. "Join the Dark Side of Visual Studio"
That Monaco font is really not good IMO. It's too whimsical and kinda.. Comic Sans-y. In my research into white vs. black backgrounds I found that the key thing is *contrast*, as in you want some contrast, but not too much of it. Avoid pure blacks on pure whites. Although I've succumbed to the inevitable ClearType now. 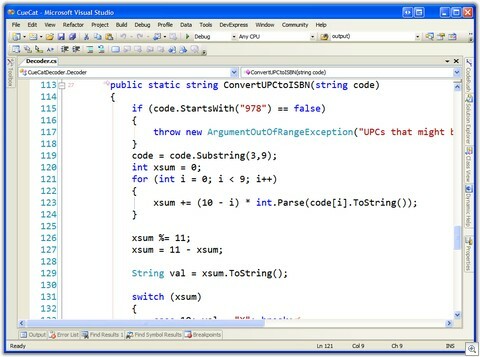 What about this blue Turno Pascal like Visual Studio? I just can't stand the whole black background; makes my eyes hurt and weep in just a few minutes. So I guess that makes me a white backgrounf kind of guy. That said, I never run with the default colors in VS, either; I rather have it a little bit more costumized to bring out a few things. I think Craig hit the nail. For the last 6 months I've been perceiving an increasing rate of eyelash fall, with all its unwanted side effects such as eye pricking, etc. I blame it on the 10+ hours/day on the computer. Although I cannot prove it scientifically, I suspect an inappropriate combination of radiation/brightness/contrast/background colors/font colors/font types and sizes are the culprit of my lash fall and eye strain. I was seen by an ophtalmologist and he prescribed a couple of meds and glasses. Too soon to tell if they're effective. For the time being my lash fall and eye strain continue. Monitors I work on? 19" Samsung SyncMaster 997MB's. What measures have you taken guys to protect your eyes from monitor glare/radiation ? I've been using a black background for all my IDE's for about 5 years now. I find it very easy on the eye strain factor. I also have all my Windows "appearance" colors shaded downward to heavier grays and and have eliminated almost all large white areas (for the programs that support color changing). It's also helpful to have ambient light behind your monitors (desk lamp), to help make your visual perspective more 3D. If your room light source is behind you, shining on your monitors, than it makes your vision very "flat" and contributes to more eye strain. Note: you'll probably find a black background is difficult to read when doing a standup presentation with a Projector. Add me to the list of those still in love with the Borland color schemes. Before Delphi8 forced us to migrate to Visual Studio, I was a big fan of the Twilight scheme, so I did my best to re-create it in VS. 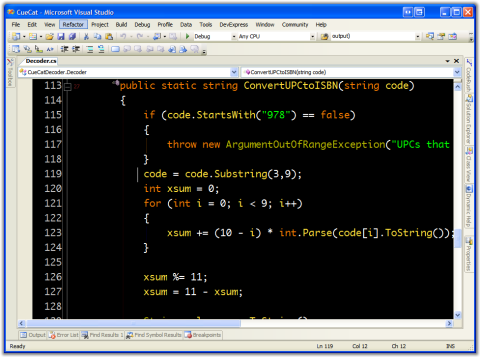 I have tried black background a few times but always returned to visual studios default theme. But I tried again and I think I like my result this time so I will try it out for a few days (click my name link to view a screenshot). I love black backgrounds. Much easier on the eyes once you are used to it. Scott, you should change the background color on Notepad2 as well. I did and never looked back. Black backgrounds tend to cause halation for me much worse than white backgrounds. Partly, I think, because I wear glasses. But as long as the contrast is set appropriately, they are equally readable. 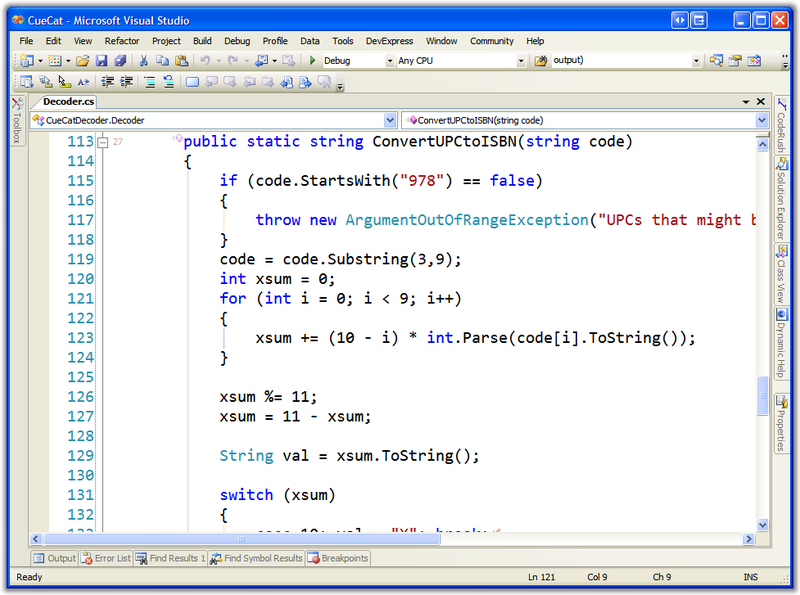 We need to have some sort of "hotornot" website for IDE color schemes, along with links to download the exported VS2005 settings for that scheme. Never thought I would even think on these lines. Now you have me experimenting with different colors. Hmmm. Productive use of company time :) LOL. Love the black theme though. Thanks. Jeff, I like that idea a lot. I've been searching for good color schemes a while. I think the one Scott suggested is not sophisticated enough. Jeff, that sounds like a pretty cool idea, I'd say. I'd certainly like to see it, and contribute my own couple of schemes! We had a study performed some years ago for our AutoCAD users. Historically most AutoCAD users have used a black background and some white but we found that most users appreciated a grayish background because that didn't make the contrast agains the walls and other stuff around the monitor too big. Most users continued using a gray like background color and it might be a good idea for coders as well. I'll give it a try. Then of course the contrast need to be good for the text so good colors are required to find. The white background is an attempt to mimic a piece of paper, which does not take into account the fundamental difference of emmited light versus reflected light. Movie credits always use a black background, as do most lighted signs. It is simply much easier on the eye to have the vast majority of the screenspace not lit. Aaron can you upload your settings please? I've always gone with the black background... far more comfortable when you're at the screen 12 hours a day. Also I make sure that literal string and magic numbers are in bold red - just so they stick out like a sore thumb. Don't want too many of those in my code if I can help it. Try these settings (let me know if it doesn't work). I'm one of the gray background people... my eyes have been glad for some time now. My Autumn colors for vs2k5 / resharper. Errors show up red background with black text to offset them. More of what you see in everyday coding is in the bottom few lines. text input field max length for url exceeded... here's full url. Please contribute! I'm setting up the Vibrant Ink theme now for download.